TEPCO has reported on the frozen wall nine months after Japan’s nuclear regulator expressed skepticism about the wall’s effectiveness. Japan’s Nuclear Regulation Authority chairman Toyoshi Fuketa suggested last March that the wall was only partially effective. He considered the effort to pump water out of the subdrain system around the reactors to play a considerable role in the reduction of groundwater infiltrating the reactor buildings. TEPCO estimated back in March that 189 tons of contaminated water per day would be created by groundwater infiltration without the ice wall. 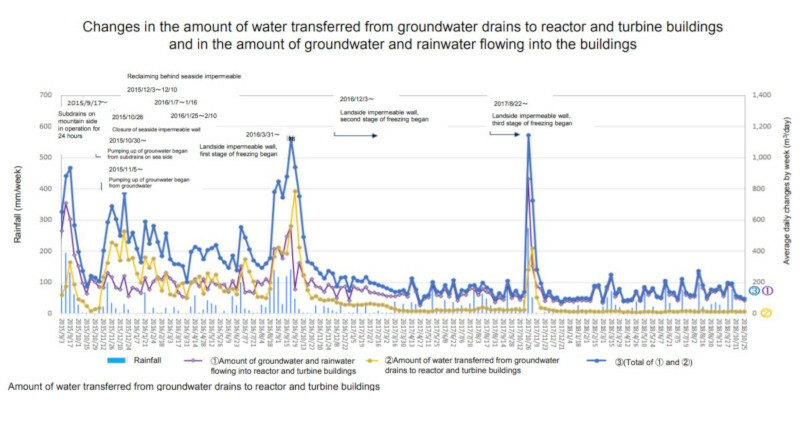 TEPCO’s October report documents 97 tons of contaminated water, a combination of groundwater and rainwater infiltration that were pumped out per day. Precipitation in Fukushima for 2018 to date has been lower than in recent years. The plant site managed to not receive any direct hit by typhoons passing through the region. This may have caused more favorable conditions that did not provide a major challenge to the ice wall and groundwater transfer systems. The newest graph documenting water transfers of groundwater and rainwater infiltration show that the amount of water in need of removal has stayed down since the frozen wall system was fully implemented. This doesn’t mean that contaminated water is not continuing to leak out of the site or that the frozen wall itself is the sole cause for improvement. As the NRA has highlighted, the combination of actions taken may have created the improved situation. A summer of more severe rainfall and typhoons could still prove a challenge to these systems. TEPCO’s full report in English can be found here.